It’s hard to believe, but Porsche design – and the Germans in general – were able to reboot and go from thinking about Tiger tanks to sports cars in the span of just three years. In 1948, the first Porsche 356 emerged from a converted sawmill in Gmund, Austria (the Allied occupation forces were the new residents of Porsche’s Stuttgart, Germany offices). By 1950, a much improved version of the Porsche 356 built in Zuffenhausen, Germany was being sold in America. Early U.S. importer Max Hoffman was responsible for the most-iconic 356 body style, the Speedster, which was a rather stripped down and basic $2,995 version of the car with racing-style bucket seats, removable side curtains instead of roll-up windows and a low windshield that the weekend racers who favored the model could easily remove. 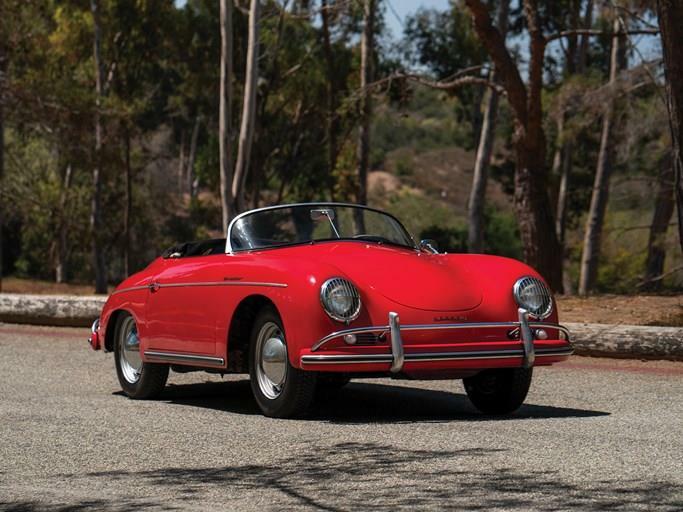 Other body styles included the coupe and Cabriolet (with a plush well-lined convertible top), and the Convertible D and roadster (models with more basic tops and shorter windshields that effectively replaced the Speedster). All were available with a variety of pushrod four-cylinder engines of varying displacements and power. “Super” was generally reserved for the higher-horsepower pushrod engines. The A series (356A) was the first refinement of the line introducing numerous refinements including a curved windshield rather than a split or bent screen. In late 1959, the B-series (356B) brought the first substantial styling changes in terms of headlight treatment and bumpers and a short-lived notchback coupe body style. Disc brakes finally arrived with the C-series cars (356C) in 1964 along with the most powerful pushrod engine yet, the 95 hp SC. By the 1966 model year, the venerable 356 had been supplanted by the 911 and 912. The sophisticated and powerful four-cam Carrera motor was available in GS Speedster, Cabriolet, and coupe forms from 1956 to 1959. Race-minded enthusiasts could upgrade their GS Speedster or coupe to GT spec, which included a much larger fuel tank, a Plexiglas windshield, alloy body panels, and a host of other weight-saving and performance measures. The immensely complex engines were the most technologically advanced units Porsche ever installed in the 356, and today the cars are at the top of the 356 hierarchy. All 356s were built before Porsche discovered how to really rust-proof cars as they would in the mid-1970s, so they are hideously rust-prone and expensive to restore. As such, it’s best to choose carefully. But when they’re right, a 356 is reliable, usable and satisfying like almost nothing else from the 1950s or 1960s.